Odell Clark wants nothing more than to provide for his family. 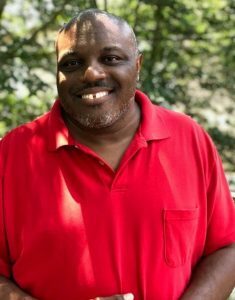 He firmly believes Monarch’s Wake County Individual Placement and Support (IPS) specialists provided the guiding hand he needed to accomplish that goal when Clark, 49, formerly employed with a family-owned furniture delivery company, found himself out of a job. The unemployed status did not help Clark’s existing depression diagnosis. Employment Support Professional (ESP) Precious Haynes recalls one of her initial conversations with Clark when they were just getting to know each other. Haynes explains that Clark was a referral, meaning it was necessary for the Wake IPS staff to conduct an intake process to gather information needed about his employment background, his interests and aspirations so the job search could begin. These preliminary investigative steps help in finding the right employment fit for the people we support. One-on-one guidance, Haynes illustrates, is offered in a variety of areas. Clark received assistance with job search resources including the online application process; establishing accounts within employment websites including North Carolina Works, an online resource in which candidates can search for jobs, as well as education and training opportunities; and crafting a resume. He also received help and suggestions from William Fletcher, a Monarch certified peer support counselor. Clark had heard about job search services offered through Monarch’s Wake County office from a friend and thought it might be an avenue worth investigating. “I came to Monarch and asked a lot of questions and they told me about the program and the resources available,” Clark said of the initial job search stages. About two months into Clark’s job search process, he saw a position posted advertising the need for a full-time groundskeeper. Equipped with his one-on-one interview training and resources, Clark went in for the face-to-face interview. To his surprise, he was hired on the spot. “I did not expect that!” he said of the quick job confirmation. It really came as no surprise to Haynes. “Odell is an absolute pleasure to work with. He is a hard worker who wants to work and better himself. He is dependable and his works speaks for itself,” she confirms. Clark is now employed as the groundskeeper at Raleigh’s Creekside Apartments where he makes sure the property is in excellent shape for both renters and potential apartment seekers. Other responsibilities include assisting the maintenance team with repairs. Not only has employment allowed Clark to provide for his family, but it has brought some added health benefits. Being active throughout the work week has helped him lose 39 pounds and about five clothing sizes. “I don’t eat as much as I used to because I am busy working,” Clark said.